The Addicted to Holos box for June has arrived and I'm excited to share the polishes with you before their upcoming launch! 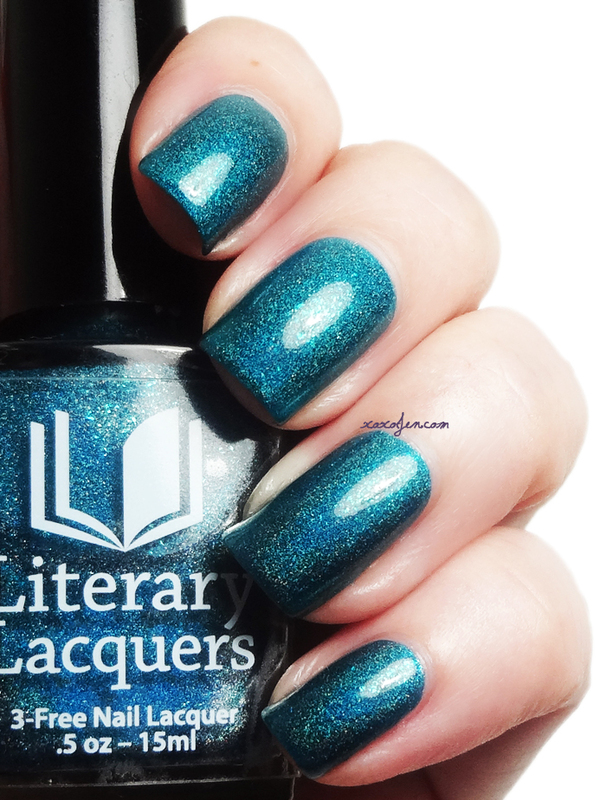 Literary Lacquer's Salt & Sweetness is a very rich shade of teal with blue flakes and liner holographic pigment. The richness and variation of color reminds me of time I spent snorkeling in the oceans off the coast of Hawaii. The formula for this polish is perfection as usual, and opaque in two coats. Sweet Heart Polish made the palest blue holo called Summer Breeze which I think describes the color of this polish perfectly. The holographic finish is very strong in full sun, and I was still able to capture it under studio lighting. I wore two coats with topcoat and the formula was excellent. June Bug is a creamy orange-ish shade with subtle holo shimmer made by Philly Loves Lacquer. I found the formula to be thick, but I was able to apply it in two thin coats. You may get away with one heavier coat, as this one is quite pigmented! Love Potion from The Polish Bar is a strong holographic flirty shade of pink and it even has tiny holo glitters in it for an extra bit of sparkle. Perfect for hot summer days and quite eye catching! I wore two easy coats with topcoat for the photos. 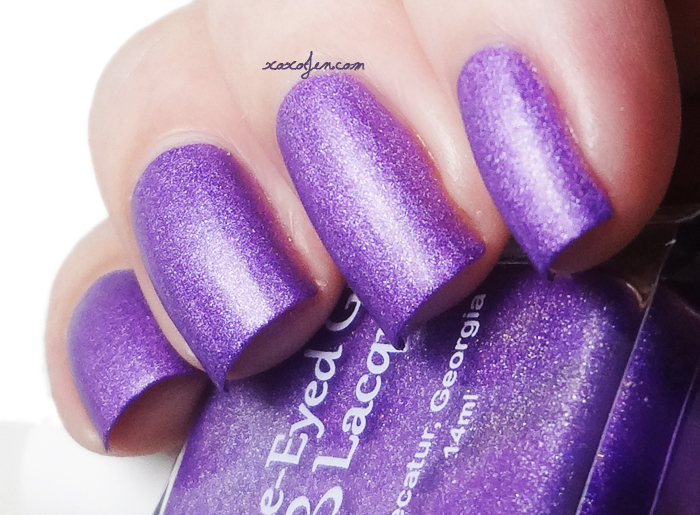 Blue-Eyed Girl brings us Bikinis & Flip Flops, a great medium purple holo shimmer polish which has a matte finish! 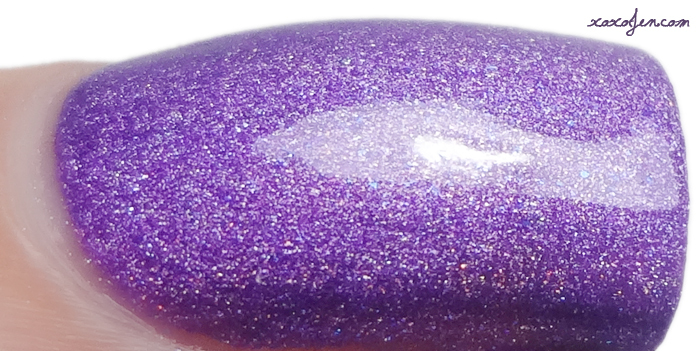 I snapped a photo of that first and then topcoated to really show off the shimmer. The formula was really smooth and easy to apply, no dragging or pulling the way some mattes are. Are you excited about this upcoming box? I sure am! I really enjoyed the palette of colors, the perfect combination for summer. I think that these would also be great to use for nail art as well since there's a good contrast between these shades. 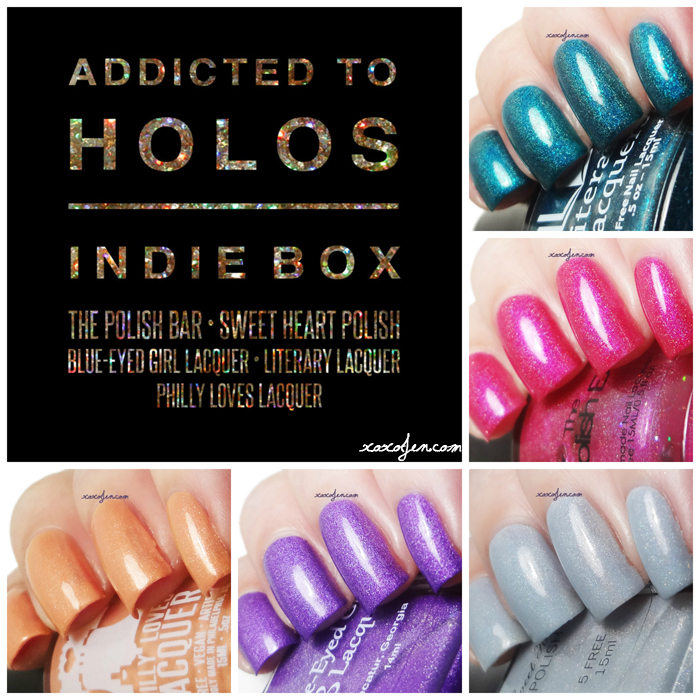 The Addicted to Holos box will be available for pre-order 6/8 - 6/15 at http://addictedtoholos.bigcartel.com/. See ya there! Some very pretty holos for the June box. Aren't they? I like them all!